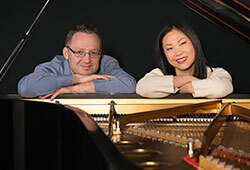 Pianists Stephanie Ho and Saar Ahuvia regularly collaborate as DUO STEPHANIE & SAAR in dazzling performances of both two-piano and four-hand repertoire, spanning the centuries from the Baroque era to the music of our own time. Recent performances include the Duo’s Lincoln Center for the Performing Arts debut with Igor Stravinsky’s The Rite of Spring, a collaboration with Philadelphia’s Orchestra 2001 in a complete performance of Frank Zappa’s The Yellow Shark and New York City’s Symphony Space “Wall to Wall Bernstein,” a marathon celebration of the centennial of the composer’s birth. Their 2018-19 season is highlighted by a recital at the Israel Conservatory of Music in Tel Aviv. The Duo’s 2017 recording of Johann Sebastian Bach’s The Art of Fugue has garnered widespread praise. Stephanie and Saar have toured The Art of Fugue extensively, with performances in Baltimore, New York City, Philadelphia, Phoenix, Portland and Sacramento, among others. Their recording of György Kurtág’s four-hand transcription of Bach’s Gottes Zeitist die allerbeste Zeit (God’s Time Is the Very Best of Times) was featured on the soundtrack of the documentary film Red Trees. Beethoven Dialogues, their 2014 CD, comprised of Quartets, Op. 18, Nos. 1, 4 and 6 in rarely heard four-hand arrangements, was chosen as “Album of the Week” on New York Pyblic Radio WQXR. Stephanie and Saar are the artistic directors of “Makrokosmos Project,” a contemporary music festival in Portland, featuring American music and Oregon-based musicians. The 2015 festival was highlighted by standing-room performances of George Crumb’s complete Makrokosmos I & II and Celestial Mechanics. Oregon Arts Watch stated, “It was one of 2015's peak Oregon musical moments.” “Makrokosmos Project” has subsequently presented the entirety of Crumb’s Makrokosmos I-IV and premiered works by Gerald Levinson, Branic Howard and Gregory Hutter. While pursuing graduate studies at the Peabody Institute of the Johns Hopkins University, Stephanie Ho and Saar Ahuvia were inspired by Leon Fleisher to explore the Beethoven string quartets in a duo piano setting. Saar Ahuvia, a native of Israel, studied at the Tel Aviv Academy and Switzerland’s Schaufhausen Conservatory before coming to the United States to pursue a Graduate Performance Diploma with Leon Fleisher at the Peabody Institute. Stephanie Ho, of Taiwanese descent, grew up in Portland, Oregon before earning degrees from Oberlin College and Northwestern University. She received a Graduate Performance Diploma from the Peabody Institute, under the direction of Julian Martin. Stephanie and Saar, who are married to each other, reside in New York City. Outdoor enthusiasts, they recently completed the 93-mile “Wonerland Trail” around Mount Rainier. Of course, this being Le Poisson Rouge, the married pair played five works by Bach, with one Frescobaldi piece tossed in, as arranged for four-hand piano by Gyorgy Kurtag. Mr. Kurtag’s arrangements, filtered through his contemporary sensibility, emerge as riveting transformation of the originals. The duo gave beautifully understated performances. In his piano transcriptions of music from the cantatas and organ works of J.S. Bach, Kurtág engages the music with persuasiveness and a controlled sense of voicing that is simply not found among other such arrangements. I like the recording very much–natural piano sound, soft, vibrant, and played with a lot of style. The pieces, mostly chorale preludes, are stunningly rendered and beautifully conceived. I have seldom heard such fine arrangements, hinting at the true Baroque world that is Bach while at the same time peppering the music with a dose of modern sensibility that soothes the soul in a remarkable way. I can’t imagine that anyone, Bach purist or modernist, would object to such persuasive playing. Stephanie Ho and Saar Ahuvia performed the solo parts in the Concerto for Two Pianos by Bohuslav Martinu. With precise technical and artistic consistency they conveyed the peculiar uniqueness of the music in a masterful way. The characterized the different elements exquisitely, from the compactness of the first movement with its almost constant simultaneity to the individually shaped solo sections in the second movement. Bach Crossings, a first release for DUO Stephanie and Saar on New Focus Recordings, is a crossing of paths, crossing of minds and inspirations. The music of Johann Sebastian Bach is recast and given new light by one of the most creative living composers of our time, György Kurtág, and one who is obsessed by Bach. In addition to being drop dead gorgeous, if totally anachronistic, these performances and arrangements explain what ‘voicing’ is in Bach (i.e., how to hear the voice with the melody among all the other notes), setting off the high radiant in Bach. Here is voicing in practice rather than just in theory: the sound is both modern and grand, strange yet familiar, just the thing for jaded Bachians. At the end the Duo throw in two Kurtág arrangements of Frescobaldi at his most delectable. The rapport between Ho and Ahuvia was readily apparent throughout their portion of the program; their music-making placed added value on elegance and subtlety. It is clear from the precision and elegant phrasing on this disc [Bach Crossings] that this is a tight partnership between two pianists who developed an implicit understanding of each other’s musicality. The articulation is clear and bright, and the pianists capture the lively spirit of the dance-like sections with character and class, evoking joyful images of tankard-swilling, pot-bellied revellers. The playing is well balanced between the two parts and there is a strong overall sense of musical line, with the lilting interactions and echoes finely balanced. Duo Stephanie and Saar traversed a menu of -jazz-infused works with fine technique and musicality. Still, it’s clear that the husband-and-wife team of Stephanie Ho and Saar Ahuvia are classicists at heart and their strongest performances were in music of Chopin and Beethoven. The piano sound was clear and immediate, the tone rounded and warm. Saturday brought four absorbing lectures in a row. The third was a recital in disguise: an elegant performance by Stephanie & Saar of contemporary composer Gyötgy Kurtág’s transcriptions of J.S. Bach’s music, indeed their entire recently released CD, Bach Crossings. The duo showed a real feel for this repertory. Lines sang out clearly, and pedaling was always perfectly judged. The performance was visually fascinating as well: Kurtág created them for himself and his wife, and their multiple and extreme hand crossings are obviously designed for a couple who like each other very much. Stephanie & Saar’s concert was an example of festival programming that brought innovation, new works and new approaches to the Sarajevo concert scene. This was an opportunity for the audience to be a part of the latest current in new music performance practice, at its world’s highest level. ‘Out of the Box’ materialized here in its ideal edition. Bravo, Stephanie & Saar!